Total Score: 8.15 - BEST VALUE AWARD! Introduction: In 2011, Daiwa created a stir with the introduction of their innovative T-Wing level wind. 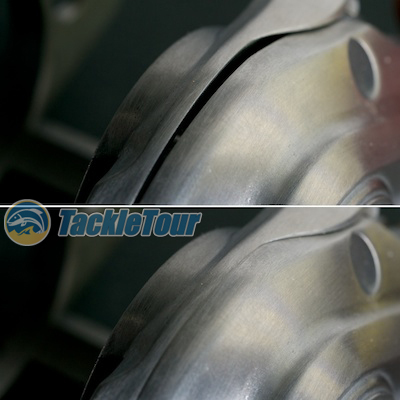 The final product, the T3 and T3 Ballistic casting reels, were met with mixed reviews here on TackleTour. Now, just two short years later, they've embarked on a large R&D campaign titled "Project T" to introduce the next generation of reels enabled with this levelwind technology. This so called project is teased in a 10 part youTube video series aimed at creating excitement and intrigue over two new reels. By most accounts, despite a few obvious technical faux-pas by their prostaff, it worked. The buzz on our discussion forum alone was out of control with readers taking screen shots of the videos and sharing them so they could offer their thoughts on exactly what Daiwa was up to with Project T.
Screen shots like this, taken off of Daiwa's Project T videos, were rampant on our forum as excitement and conjecture over Daiwa's new reel swelled. Earlier this year, prior to any of the videos being debuted, we received a call from Daiwa at HQ. They had a product they wanted to send up to us for a private, non-biased comment and evaluation. The only catch was we had to keep everything under wraps and not say a word until ICAST. Not an issue considering they'd be one of many manufacturers for which we extend this courtesy. A couple of weeks later, the product materialized at HQ and we've had a chance to take it out on the water and subsequently take it apart in the lab. 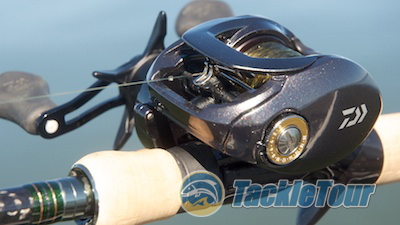 Here now is our exclusive REVIEW of Daiwa's 2013 ICAST debut product, the Tatula Baitcasting reel. Introducing the much anticipated star behind Project T - Daiwa's Tatula. Quality / Construction: Daiwa's new, Tatula Baitcasting reel comes in right smack in the middle of perhaps the most hotly contested price range for baitcasting reels. It carries an MSRP of $149.95. At this price point, the Tatula's primary competition are reels like Shimano's Curado G, Abu Garcia's Revo SX, Quantum's PT Energy, Lew's Tournament Speed Spool, Okuma's Citrix, and so on. The Tatula features an aluminum frame and handle-side plate. This is the price point within the market where expectations for refinement are relatively low, but where they are high for performance. Consumers at this price point want bang for their buck. Does the Tatula deliver? Daiwa worked hard to ensure the fit between sideplate and frame were extremely precise on the Tatula. The Tatula is painted with a dark grey, metallic finish and is put together rather solidly with no unusual gaps or alignment issues between the frame and side plate. In fact, Daiwa has gone to great pains to ensure the fit between the handle sideplate and frame (both made of aluminum) are extremely precise. Play in the reel's handle and knobs is very minimal. 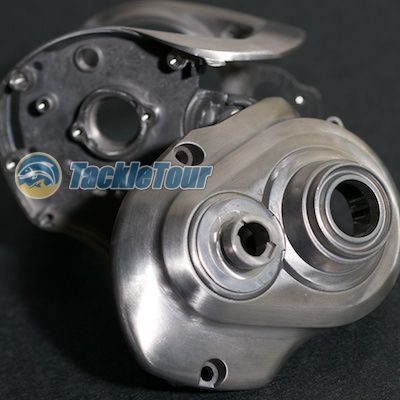 Overall, the Tatula has a good feel to it build-wise worthy of a product that sits just above the Lexa in Daiwa's lineup. 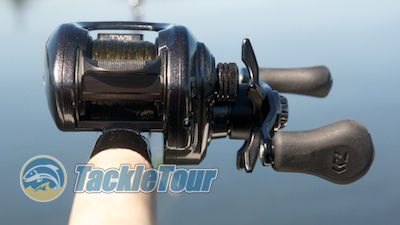 Performance: We took the Tatula out on the water with us on a couple of trips prior to ICAST. Just enough time to get a good feel for what it's all about. I fished this reel on both a Daiwa Zillion TDZL691MHXB casting rod and a Megabass F7-72XX all the while with 16lb Sunline Super Natural monofilament spooled on the reel. Spooled with 16lb Sunline Super Natural, mounted on a Megabass F7-72XX and ready to go. 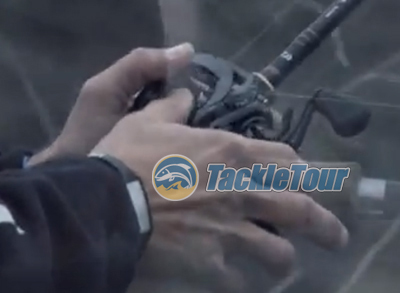 Retrieve: Our test sample of the Tatula was a right handed, 6.3:1 retrieve ratio model. The final product will be offered in both left and right hand retrieve in three different ratios : 5.4:1, 6.3:1, & 7.3:1. All models will come with a ninety millimeter (90 mm) handle capped with new oversized knobs. 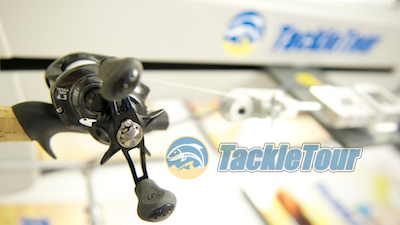 The Tatula is available in three retrieve ratios to suit your application. Daiwa is marketing the Tatula with what they are calling their new "Air Rotation" precision machined gearing for smoother rotation. Out of the box, I was skeptical of this claim, but out on the water there's a discernible difference between this reel and its next closest sibling, the Lexa. A look at the rear. It's a little difficult to describe, but in the past, Daiwa reels in general were built with a more connected feel to the gearing. 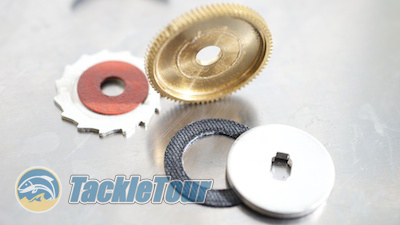 Reels like the Zillion are smooth, but you can still feel the gears working as you turn the handle of the reel. This wasn't in a bad way. It was good and something that let you feel connected to your lure. The thumbar and dragstar are both made of Zaion. Daiwa's new Air Rotation feature takes this feeling away and shields you from the gearing almost entirely. What I found odd was you can't tell by just taking the Tatula out of the box and spinning the handle. You have to actually fish it to experience this sensation because it's when the reel is under load that the benefit is actually palpable. 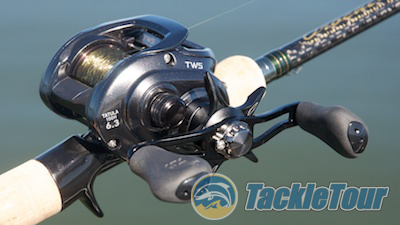 Daiwa goes with a new design for the Tatula's drag stack. 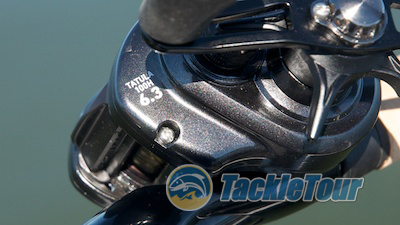 Drag: Manufacturer specifications on the Tatula is for 13.2 pounds of maximum drag pressure. With the debut of our new, Sweet Drag Performance Chart, earlier this year, we've side stepped the Maximum Drag performance debate and instead are focusing on what we feel are two more important factors - the combination of smoothness and consistency for a term we're referring to as "sweet drag" (smooth + consist = sweet). Fig 1. 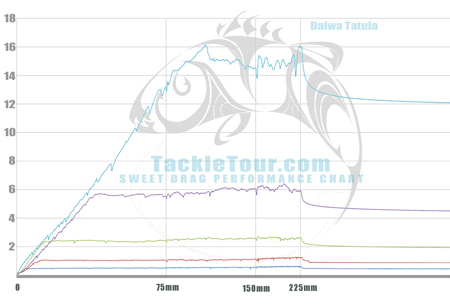 Above is our Sweet Drag Performance Chart for the Daiwa Tatula. In this chart, you can see, once the max drag is reached for each setting, the Tatula's drag is relatively smooth and consistent, but when buttoned down, it becomes more erratic. We tested the Tatula through 5 different settings ranging from one full turn of the drag star adjustment, to finger-tight lockdown. What we found is that through its lower range, the Tatula is very smooth and consistent offering predictable performance. 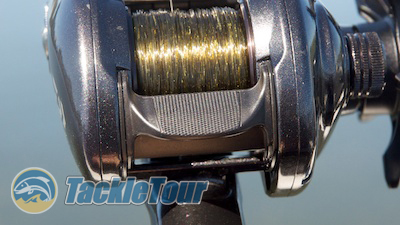 What we did not expect was for this reel to exceed the manufacturer's ratings for maximum drag. Adjusted to finger tight lockdown, our Tatula tested at a maximum of 16.13 pounds of pressure. Way more than enough to do battle with largemouth bass, but what we also discovered was the drag tended to be more inconsistent when locked down to this degree fluctuating from the max of 16.13 pounds down to 14 pounds of pressure. The Tatula tested out on The Machine with 16.13 pounds of maximum drag.